Samsung's next-gen smartwatch for active people will apparently force them to use the touchscreen without the help of the company's innovative bezel ring. Internally known as Pulse, the successor to the Samsung Gear Sport will hit the market as the Galaxy Watch Active. An exclusive report by SamMobile reveals that the Galaxy Watch Active will drop the bezel ring. According to the leaked firmware files that surfaced recently on XDA Developers, this smart wearable has the Exynos 9110 processor under the hood, runs Tizen 4.0.0.3, and features a 230 mAh battery. However, SamMobile's report claims that the AMOLED display with 360 x 360 pixels has 1.1 inches in size, and not 1.3 inches, as mentioned in the firmware. Sadly, it seems that no larger model with or without a more generous battery is in the works. 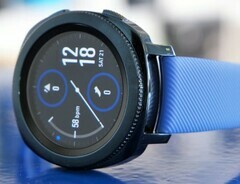 Fortunately, the smaller display and more recent processor will probably help the Galaxy Watch Active to provide at least about the same battery life as its predecessor. Finally, we should also mention that the Galaxy Watch Active will come with a redesigned charger, which is a small pad that allows the wearable to sit on it horizontally. Since this accessory is supposed to launch alongside the Galaxy S10, it will be possible to just place it on the phone and use its reverse wireless charging features. Would you get the new Samsung smartwatch without the bezel ring? Feel free to let us know what you think about its rumored specs and features in the comments below.